We had a great day. Breakfast with Beth and Kathy Couch and the Fields of Grace ministry team. A long 2:1 meeting with Beth and HCBC’s new Global Outreach Pastor on how we can expand our relationship with Back2Back Ministries. Beth speaking at Hill Country tonight to a small, but God-selected group of individuals who have now caught the passion for caring for the fatherless. God is in control. God is moving through us at Hill Country. Here is Beth speaking tonight. I’ll also leave you with a video of a story she told tonight of a special-needs girl named Gabby. Get a tissue. We are please to be hosting Beth Guckenberger at Hill Country Bible Church this Saturday evening (Nov. 22) at 7pm. We’ll be in the cafe area of HCBC, just off the Northwest Lobby. We’ll have copies of her book available for purchase. We hope you can join us. Children are welcome. Take a look at this short video Beth recently did with Zondervan, her publishing company, in advance of the book being available. In it she tells the heart-wrenching story of how some of these children come to live in the children’s homes they serve. Tonight, we’re at Hill Country Bible Church setting up for the public showing of The Heart Gallery of Central Texas. The gallery is part of a whole schedule of activities we have in store for November. We’re excited because this is one of our first big outreach activities to encourage those in our church body to consider being part of the domestic foster and foster/adopt program. If you attend HCBC NW, we encourage you to peruse the exhibit, which will be on the lower level near Roaster’s Coffee and directly above that area in the 2nd floor hallway. It will be on display starting Nov. 14 through Nov. 23. If you have questions, e-mail us at fieldsofgrace@hcbc.com. Re-pro-duc-tion, a noun, circa 1650-60, the combining of re and production, defined several different ways. Something reproduced, especially in the faithfulness of its resemblance to the form and elements of the original; a fine reproductions of a painting by Matisse. Biology: the sexual or asexual process by which organisms generate new individuals of the same kind; procreation. Anita and I had some folks over for dinner tonight from Hill Country Bible Church Pflugerville, who also have an adopted daughter from China and are interested in continuing what we’ve done at HCBC-NW at their church – a reproduction of sorts of Fields of Grace. We met with them more than a year ago and they are now ready to get started. It’s exciting to see where they are, to see what they are nervous about but most of all to see their energy and passion for casting a vision for their church of how God calls us all to care for the fatherless, the most helpless of the world. If you are interested in joining with them, drop us a note here and we’ll be sure to connect you. We’ll be praying for you Alan and Dawn. So what have we been up to with Fields of Grace lately? Well, with November being National Adoption Month, we’ve got quite a few things planned. See below the full list. HCBCNW considers it a privilege to host this portrait gallery of Central Texas foster children. The Heart Gallery provides awareness of the need for adoptive families, and more importantly helps find permanent families for children. Please take time to view the gallery and pick up additional information. Come celebrate the opening of the Heart Gallery with other foster and/or adoptive families. We will have a potluck dinner and fellowship and the gallery will be open throughout. There’s a critical shortage of loving, secure homes that will unconditionally commit to making a difference in the lives of these hurting children. We will be holding 2 identical meetings to provide information and answer questions for those interested in becoming Foster Parents. Training to come in January 2009. Beth Guckenberger and her husband Todd established Back2Back Ministries to help orphans—the poorest, most defenseless members of a needy populace of Monterrey, Mexico. Come hear Beth share about how God used her experiences to grow her faith into a reckless faith—a willingness to trust even when you don’t understand. Pick up a copy of her book in the Resource Center. Also, take a look at some of her interviews here. For the second year, the HCBCNW Tree of Lights will include the wish lists of Central Texas Foster children. Please stop by and pick up a tag or two to provide a special gift for these children. 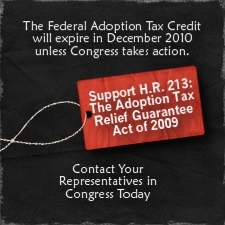 We are announcing an Adoption Loan Fund program, beginning January 2009. While many believers are stepping out in faith and following God’s direction to care for orphans and expand their families through adoption, seemingly insurmountable financial obstacles along the way often discourage them. By establishing an adoption fund, we can minister to HCBCNW families by removing the financial barriers frequently faced by adoptive families. Full details on all of these activities can be found at our website at http://www.hcbc.com/fieldsofgrace.